If you read too many of those books found in the business-hagiography section at the airport bookstore -- you know, the kind that tell you the story of Amazon or Dell or Google or Starbucks, and how it zigged where everyone else was zagging, and how this led to magnificent riches -- you'll start to notice a pattern. Virtually all the companies you see profiled are huge successes, with the minor exception of a few spectacularly huge failures that are so spectacular and so huge that they're just doggone fun to read about. Enron and whatnot. The problem is that trying to copy one company's model is a fool's errand. It's hard to figure out which part of the Starbucks formula made the business a smash hit while so many of its rivals failed. Starbucks's success is the product of a combination of factors that came together in precisely the right way at precisely the right time. It's nearly impossible to isolate which one was the most important. You would probably have to look at the hundreds of small coffee chains that didn't make it big before you stood a chance of seeing what really distinguished Starbucks. In investing, the phenomenon of looking too closely at success and not at all at failure is known as survivorship bias. For example, if you read somewhere that "the average investment fund returned 8.3 percent" -- I just made that up -- you need to remember that the calculation most likely excludes all the funds that lost so much that they closed down. The survivorship bias in entrepreneurship was on my mind a few months ago. My company was putting together a conference in Boston, and I invited my friend Jessica Livingston to speak. Jessica is the co-founder of a small angel investment group called Y Combinator. Its model is to give a few thousand dollars to groups of two or three geeks to start tech companies. She has also written a book called Founders at Work, in which she interviews the founders of about 30 successful start-ups. When she asked me what she should speak about, I asked her to consider describing all the different ways a start-up can fail, rather than the usual stuff about lessons learned from people who succeeded. "That would be boring," she told me. "They all fail for the same reason: People just stop working on their business." Um, yeah, well, sure, and most people die because their heart stops beating. But somehow dying in different ways is still interesting enough to support 40 hours a week of prime-time programming. But the more I thought about it, the more I realized Jessica was onto something. Why do start-ups fail? As she pointed out, it's usually a collapse of motivation -- everyone wanders back to civilian life, and the start-up ends, not with a bang but a whimper. Paul Graham, Jessica's husband and partner in Y Combinator, has tackled this subject on his website. "The biggest reason founders stop working on their start-ups is that they get demoralized," he writes. "Some people seem to have unlimited self-generated morale. These almost always succeed. At the other extreme, there are people who seem to have no ability to do this; they need a boss to motivate them. In the middle there is a large band of people who have some, but not unlimited, ability to motivate themselves. These can succeed through careful morale management (and some luck)." So, who is capable of "careful morale management," and what does it entail? In my mind, an entrepreneur is like a kid playing with his first shortwave radio. He takes it home and turns it on, and what does he hear? This might be demoralizing. So he tries a different frequency. And this might be demoralizing again. Until his mom wanders by and plugs in the antenna on the radio, and suddenly, he picks up the ghost of a station! It sounds like it's far away, and they seem to be speaking -- what is that language they're speaking? Never mind, it's a station! An antenna! Who knew? The kid runs off to blog about how cool antennas are. As the business progresses, you start trying to turn all the various knobs on your fancy radio set in order to get better reception or to find a station you like. And fortunately, in business, we founders have a lot of knobs to play with. There's price. Location. Employees. Marketing. Advertising. Return policies. Trade shows. Products. Search-engine optimization. And every item in your budget. Say you decide to open a restaurant. You rent space, fill it with tables, stock the kitchen, and hire a bunch of waiters and a host to seat people and answer the phone and take reservations. And then, on the night of your grand opening: [imagine the sound of crickets here]. At this moment, a founder who is incapable of careful morale management will think to himself, Maybe a career in HR management isn't so bad after all. Meanwhile, the determined founder will start playing with the dials -- rethinking the menu, trying new promotions, and adjusting prices. And what he'll find is that, just like the tuner on a radio, certain aspects of a business can be off by only a little bit and then, one tiny adjustment, and BING! The thing starts working. 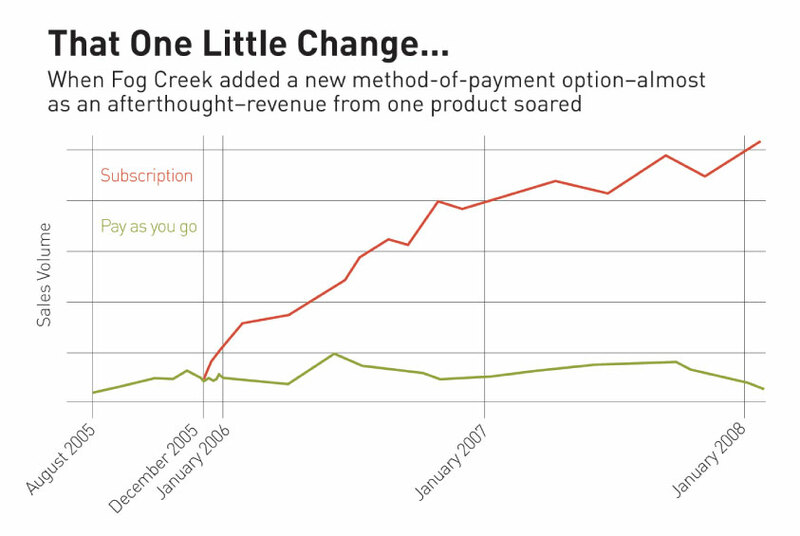 Consider, for example, the sales chart for one of our products, Fog Creek Copilot. At first, we charged $10 a day, and every time a customer wanted to use the service, he or she had to whip out a credit card and type in those 16 digits or use PayPal. As the green line on the chart indicates, we had steady but unremarkable sales. Then, in December 2005, one of my developers built a subscription service so that customers could sign up to be automatically billed every month. We thought this would be a minor convenience for some users. Turns out, we had wildly underestimated the impact this new method of payment would have. As the red line shows, sales took off. We might have given up on Copilot if we had kept it as a pay-as-you-go product. We develop other kinds of software, but if we had been a one-product shop, we might have turned into just another start-up that fails because everyone becomes demoralized and wanders off, never knowing how close good reception was. Luckily, that didn't happen. Once we added subscriptions -- wow! It was as if, after months of static, we picked up an Australian radio station that got stronger and clearer each day. We still keep playing with the dials and moving the antenna. We recently lowered the price of a monthly subscription in hopes of increasing the overall growth rate. The jury's still out on that decision. But I'll keep making adjustments until I stumble upon the formula that makes Fog Creek such a big success that you'll be able to read all about it at the airport bookstore. Joel Spolsky is the co-founder and CEO of Fog Creek Software and the host of the popular blog Joel on Software. To read his past columns, go to www.inc.com/keyword/spolsky.